The Amsler grid is a simple and effective visual tool. The purpose of the grid is to monitor for changes in central vision. The grid is contained on a square piece of paper with a dot in the center. It may be placed on a mirror, refrigerator or other prominent place in your home. When checking the grid, please wear reading glasses if they are needed for near vision. The grid should be held at the same distance and position one would normally hold a piece of paper to be read. Cover one eye, and view the grid with the other eye for a few seconds. Grid changes may occur and could indicate a progression in your retinal disease. For example, straight lines may appear bent, curved or distorted. The grid itself could appear darker or disappear entirely. Or the central dot could disappear. It is very important to cover your healthy eye while checking the grid, as it can mask grid and vision changes. If grid distortions do occur, check it again in a few hours. If changes persist, please call the office for consultation. How do I use the Amsler Grid? The grid should be used with reading glasses, in good light and held at a comfortable reading distance. Both eyes are tested, one at a time. Covering one eye, the other eye is focused on the center dot, noting the location and size of any irregularities in vision - including wavy, fuzzy or gray areas, or blind spots. 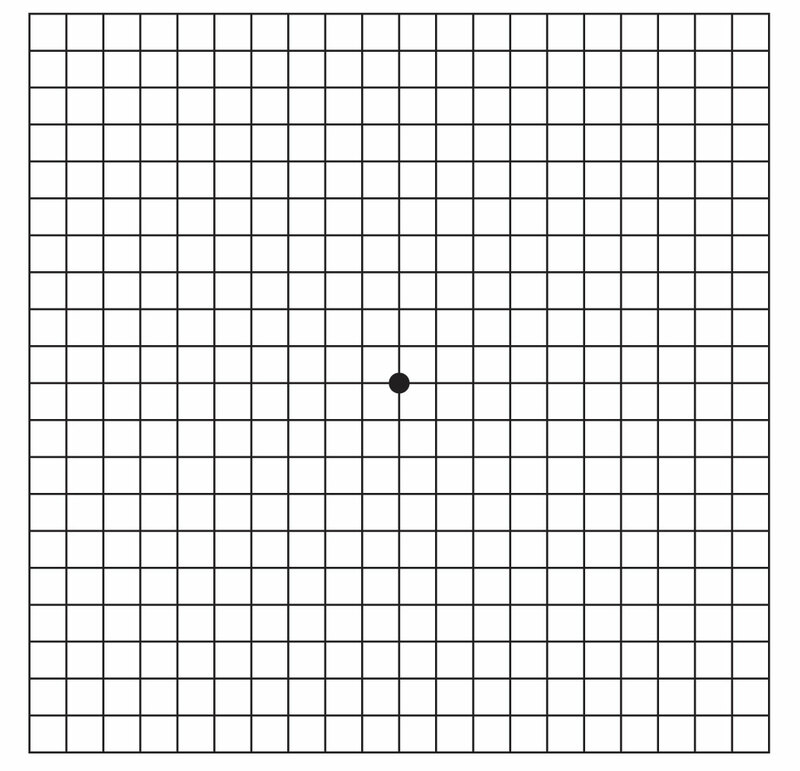 It is important to stay focused on the center dot and analyze the remainder of the grid using the peripheral vision. If changes occur and they persist for several days, the patient should be examined promptly. © 2019, Retinal Consultants of Southern California.